The rally, on Saturday from noon to 11 p.m., in Heise Park, will include testimonials, speakers, music, information on drug rehab and more. GALION — Mary Shoup won’t take no for an answer. In the past year, she’s witness a nephew and niece die of substance abuse. She said her father died of alcoholism. She’s tired. Tired of the tragedy associated with substance abuse. So she’s doing everything she can to help others from experiencing the pain she will live with every day for the rest of her life. On Saturday, July 29, Shoup, who lives in Galion, will hold a “Take Back Our Community” rally. It’s from noon to 11 p.m. at the band stand in Heise Park, between the community center and the softball fields. There will be testimonials and guest speakers from noon to 6 p.m. There will be a vigil from 6-7 p.m. in honor of anyone who has lost a family member, friend or loved one to addiction. A concert will run from 7-11 p.m. There will be representatives from drug rehab centers available to talk with anyone who feels they need help, or to anyone who knows and loves someone who needs help. Her only goal is to help as many people and families to get out from underneath their addictions. She’s had some success. Churches and other groups have helped her. She’s received donations and “scholarships” addicts can use to get to a rehab center to receive treatment. But she wants to do more. In the future, she’d like to open a “halfway house” to be used by addicts coming out of rehab. Newspapers in Mansfield and Marion have interviews and done stories with the families about addicts who died. Those stories share the horrors and the frustrations of loving someone who has an addiction. But she’s OK with that. She insists her cause is bigger than some hurt feelings. She has received help from some in Galion and other communities, but she said some refuse to admit a problem exists. And she is 100 percent certain that ignoring the problem of addiction and overdoses deaths is not going to solve the problem. “I’m going to keep talking. I’m going to keep bothering people. I’m going to keep raising money and finding ways to get addicts into rehab,” Shoup said. She understands there is a terrible stigma attached to those with addictions. The program, on the A & E network offers a real look at life behind bars at Indiana’s Clark County Jail. In the show, seven volunteers were sent to live among the general population of the jail for 60 days. Neither other inmates nor the staff at the jail knew about the volunteer. Ashleigh and her husband Zac, a former Marine, were two of the volunteers. 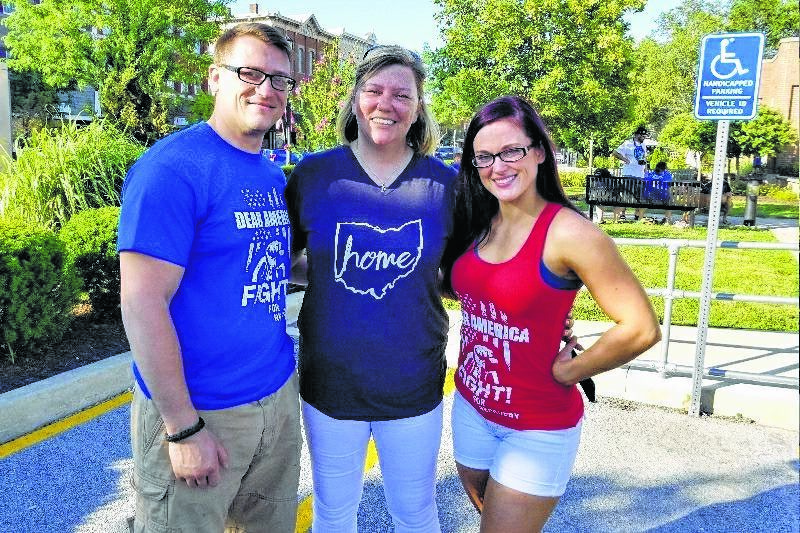 She will share information and insight about her two months in jail at the Galion rally. Shoup said if someone shows up at Saturday’s Take Back our Community rally asking for help, she will make sure they receive help. She said she has developed contacts with rehab facilities in Ohio, Florida, Kentucky, West Virginia and other states. She said she has contacts with doctors and others who also have an interest in finding ways for addicts to receive the help and care they require to treat their addictions. To do that, she needs money and she is doing what she can to raise funding. The July 29 rally doesn’t cost anything to attend. And there will be Take Back our Community t-shirts available that day for $20. For more information, you can visit the Rally for Hope page on Facebook. Russ Kent is editor of the Galion Inquirer. Email him at rkent@aimmediamidwest.com with comments or story idea.